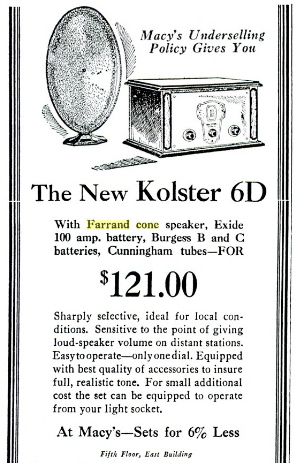 Pictured in the Macy’s ad is a 1920’s model radio with cone speaker. Created by New York inventor Clair Loring Farrand, the moving coil, direct radiator cone loudspeaker replaced the horn type speaker (a model which could not produce the sound quality of the cone speaker). Mr. Farrand held over 250 patents and his company, Farrand Industry Inc., held more than 1,000. Interesting Fact: In 1912, Mr. Farrand, working as a wireless operator, stayed up all night taking down the names of Titanic survivors from an incoming ship–a list which was to be posted in the newspapers.